At about 11:40 a.m. (Japan time) yesterday morning – 1st April 2019 – Chief Cabinet Secretary Yoshihide Suga revealed what has been, perhaps, the most closely guarded secret in Japan over the past several months: the new era name (gengō 元号) under which the Japanese calendar will operate from 1st May, once the current emperor, Akihito, abdicates and his son, Crown Prince Naruhito, takes the throne. The name announced was Reiwa 令和, and is something which will have a profound influence on all aspects of Japanese life. Come May 1st the country will no longer be in Heisei 31 – the thirty-first year of the reign of Emperor Akihito – it will enter Reiwa 1 (reiwa gan-nen) and dates on mastheads, calendars and documents will need changing at a stroke to reflect the change of reigns and historical eras. As I write, people all over Japan will be debating the meaning of the chosen characters, their origin, and what the tone and style of the new era will be, while also looking back at the just-departed Heisei (平成 ‘Achieving Peace’) era and taking stock of what it meant for them on an individual level, and the country on a national one. The custom of basing the calendar on periods according to the reigns of emperors is one Japan imported from China centuries ago. Before the Japan’s modern era began in 1868, one emperor could rule through multiple eras, and names were changed to indicate that crises had been surmounted or that there had been political changes in the court. With the ‘Restoration’ of power to the throne after two hundred and fifty years of military rule by shogun in 1868, the new government decided that henceforth there would be only one era name per emperor, beginning with Meiji 明治 (‘Bright Renewal’) (1868-1912) and followed by Taishō 大正 (‘Great Rectitude’) (1912-1926), Shōwa 昭和 (‘Shining Peace’) (1926-1989) and finally Heisei which began in 1989 and ends this year. But where do the era names come from? Previously, they have been draw from Classical Chinese literature and philosophy, but this time, in order to find inspiration, those tasked with choosing the new name looked back to Man’yōshū 万葉集, Japan’s oldest anthology of poetry, which was compiled in the mid-eighth century. The collection contains over 4,000 poems, in various formats and covering topics ranging from grand political statements to personal expressions of loss and love. One of the major sources of inspiration for the Man’yō poets was botanical: there are approximately 160 different plants referenced in the anthology, one or more of which is mentioned in about 1500 of the collection’s poems. Some of these plants are quite prosaic – there’s even a poem mentioning boiled turnips (MYS XVI: 3825) – and they remain sources of interest for the Japanese public. There are over thirty botanical gardens throughout Japan dedicated to displaying the plants and poems of Man’yōshū, and it remains a draw for historical tourism, even today (McAuley 2016), meaning the anthology is well-known, and loved. It is not, however, uncontroversial: even a few hundred years after its compilation, its language was held to be uncouth and even frightening. In his judgement on one of the poems in the Roppyakuban uta’awase 六百番歌合 (‘Poetry Contest in Six Hundred Rounds’; 1193-94), Fujiwara no Shunzei 藤原俊成 (1114-1204), Japan’s greatest mediaeval critic asks ‘what purpose is served, for the way of poetry, or for the individual, by frightening people deliberately’ through using Man’yō expressions? In his Chinjō 陳状 (‘Appeal’) against this judgement of his poem, the monk Kenshō 顕昭 (1130?-1209?) insists ‘the original forms of the poetry of Yamato [Japan] are to be found’ in the Man’yōshū, and so relying on it should be no cause for criticism (McAuley, forthcoming) (see here for draft translation of the poems in the round and Shunzei’s full judgement). In modern times, the Man’yōshū has come to been seen by some scholars as representing a ‘purer’ form of Japanese poetry, free from Chinese influence, and it was popular as a source of reading material during Japan’s ultranationalist period in the 1930s and 40s. I once interviewed a veteran of Japan’s Imperial Army, who told me that a paperback copy of the Man’yōshū was the book he took with him when sent off to fight as a young conscript, and he and his platoon would read it to each other when off duty. It is for these reasons of the Man’yōshū’s continuing popularity and connotations of purity, that it was chosen as a source for the new era name. Rather than one of the poems, though, the passage chosen was the preface to a sequence of thirty-two short poems on plum blossom (MYS V: 815-847), composed at a banquet and celebration held at the residence of Ōtomo no Tabito 大伴旅人 (665-731), the Governor-General of Dazai – the southernmost of Japan’s major islands, now called Kyushu. What, though, does this flowery literary text, recording the feelings of a group of Japanese aristocrats on Saturday, 4th February 730 (the western equivalent for 13.1 Tenpyō 2), and replete with allusions to the trees, birds and insects of the season, have to do with Japan’s new era name? Well, the original version of the text’s second sentence contains the words reigetsu 令月 (‘perfect month’) and yawaragi kaze 和らぎ風 (‘gentle breezes’). The new era name was created by taking the rei of reigetsu with its connotation of perfection and the character 和 wa which is used for the adjective yawaragi. On its own, this character carries the meaning of ‘harmony’ or ‘peace’, making one possible translation of Reiwa ‘Perfect Harmony’. 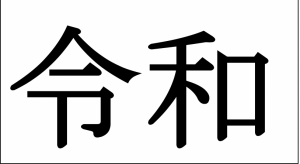 Much is being made of the fact that Reiwa is the first era name to be chosen from Japan’s own national literature, and not from a source originally written in Chinese, with suggestions being made that the choice is intended to signify a decisive break with China. This is historically dubious: Tabito was an admirer of the elegant parties and gatherings he had read about in Chinese sources, and this banquet was one of his attempts to emulate the elegance which he found so congenial, so the event itself was strongly influenced by Chinese ideas and aesthetics. In addition, the preface, while it can be, and is, read as Japanese, was written entirely in Chinese characters, and has been previously described as ‘a pastiche of phrases adapted or adopted from Chinese sources’ (Cranston 1993, 536). A break with China the original is not – if anything, it is an homage to China’s greatness, although the line ‘what difference is there between those ancient compositions and those of the present?’ can be taken as suggesting that the Japanese compositions of Tabito and his circle are just as good as those of the ancient Chinese poets. History will judge and determine the true nature of the Reiwa era, just as it has begun to assess the significance of Heisei (‘Achieving Peace’). One can only wonder what Tabito would think, to know that his literary gathering of a few like-minded gentlemen of his entourage would one day have such a profound impact on the people of Japan. Cranston, Edwin (1993) A Waka Anthology: Volume One: The Gem-Glistening Cup. Stanford: Stanford University Press. McAuley, Thomas (2016) ‘Viewing a Myriad Leaves: Man’yō Botanical Gardens in Japan‘. International Journal of Contents Tourism 1 (2): 1-16. McAuley, Thomas (forthcoming) The Poetry Contest in Six Hundred Rounds: A Translation and Commentary. Leiden: Brill.